The plan at left shows development sites around South Street that will be subject to archaeological excavation in the coming weeks. The project covers a section of medieval Newport. Town archaeology on this scale offers a rare opportunity and it's hoped the public will be able to view the excavations in progress. In the past Newport archaeology has been generally disappointing, mainly due to 19th century building foundations destroying earlier features. This site offers more hope. When the development was first applied for in 2004, two evaluation trenches were excavated. One trench uncovered structural remains that were assessed as medieval or early post-medieval. The other trench produced a considerable volume of pottery that was provisionally dated to around 1400. The pottery was incomparable with any known examples, suggesting it was locally made. The density of sherds was considered too great for domestic occupation, leaving archaeologists to conclude it was almost certainly kiln production. The site plan covers what was the south east corner of the medieval town. Over the years development has raised the level of land fronting the river. In medieval times the land here would have sloped down towards a mill pond. Ford Mill was located on the opposite bank, first recorded in the 13th century. There are later records of the owner being frequently fined for allowing the pond to flood South Street, so the excavations may encounter evidence of periodic silting. The ever-present danger of fire in a medieval town dictated that pottery kilns were typically located on the boundary, and there are records of pottery kilns in South Street. In 1660 kilns were banned from within the bounds of Newport but it seems this edict was not always adhered to. South Street was the poorest part of town and 17th century registers show few residents in a position to pay taxes. Some occupations may have been attracted to a location near the river and it will be interesting to see if any finds can identify particular trades. 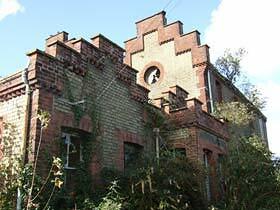 The archaeology will start once buildings have been demolished. The Planning Archaeologist, Owen Cambridge, is proposing the excavations be opened up for public viewing. Such a project in a busy town is likely to attract much interest, and perhaps provide unique educational opportunities. POWERLESS TO SAVE POWER HOUSES? Few historic buildings made a bigger contribution to the modern age than the power houses that provided the first mains electricity. You might imagine something of this revolution would be worth saving, but it's not that easy. In the grounds of Osborne House, fronting the main road, sits a quaint transformer house, built in 1903 to supply power to Osborne Cadet College. It converting 240 volts to the 105 required by the college and housed a dynamo for emergencies. The building still houses a transformer. It is owned by Scottish and Southern Energy and they recently decided to demolish it. When this was discovered, some in the community protested to the IW Conservation Dept. They were assured that English Heritage had the building listed as within the curtilage of Osborne House and it could not be taken down without planning permission. Some months later the Conservation Dept announced that the original assumption of listing had been in error and the building would now come down. This unfortunate news was presented as a fait accompli, giving the community no chance to make representations to SSE or English Heritage. The destruction seems unnecessary. 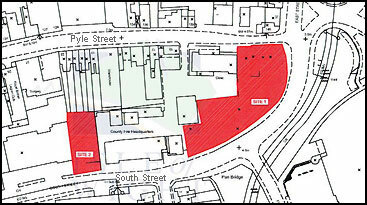 If SSE don't want the building it would certainly be of use to the community or local business. They could relocate the transformer nearby. Had the Conservation Dept, English Heritage and SSE got together, they could have surely made alternative arrangements. The transformer house was originally on line from Newport power station, via Cowes substation. The now vacant Newport power station has also become an issue. The developer is appealing against the council's decision to refuse the most recent planning application. The application proposed replacing the body of the power station with a block of flats, while retaining the familiar facade. It was refused on a range of criteria, not least the unsuitability of this type of development for the quay area. In seeking to retain the facade, the developer was responding to the council's historical assessment of the building, which places emphasis on the facade's skyline impact. In fact the soul of the building is the elegant turbine hall. 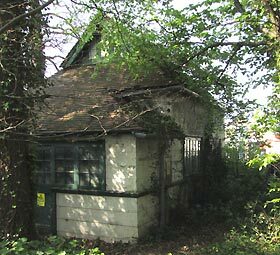 Although it has suffered neglect, it is not beyond imaginative conversion for use in a number of business or leisure applications, leaving plenty of opportunity for additional development. The turbine hall is fundamental to the purpose of the building and without it preservation would be superficial. Hopefully the appeal will fail and the council will take the opportunity to apply a more professional evaluation to their preservation criteria. At left, Osborne transformer house, due for demolition. Above, Newport power station awaits the outcome of a planning appeal. 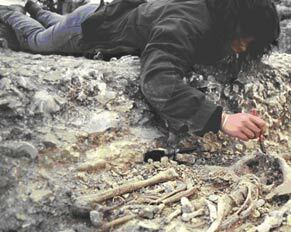 The Island's archaeological collections contain skeletal remains that have accumulated over decades. Many of these remains have never been analysed by modern osteoarchaeology methods. This summer the County Archaeology Unit will undertake a project to formally document the full list of local skeletal discoveries and subject the collection to proper study. Osteoarchaeology provides a way to understand past peoples by studying their skeletal remains to create a picture of how they lived, how healthy they were, what they ate and many more questions. However, for such studies to be meaningful they need to be placed within the wider context of palaeodemography (the study of ancient human mortality, fertility and migration), epidemiology (the study of diseases) and pathology (the study of the physical signs of disease and damage to a human skeleton) to establish how the population of an area fitted into the world around them and how it changed over time. The Isle of Wight County Archaeology Service will be carrying out an osteoarchaeology project this summer. An archaeologist who specialises in the study of human skeletons will create a database of all human remains which have been excavated on the Island from the records held in the Historic Environment Record (HER) and the County Museums Collections. She will then analyse skeletons and gather her findings so that we are able to compare the results between different sites on the Island and against other sites of the same periods in Britain and the rest of the world. As an Island, it is possible that the past influences on our population may differ from the mainland due to altering levels of outside interaction and access to resources. These factors may, in turn, affect health, disease and variation in skeletal remains. The planned project provides a valuable opportunity to answer questions about changes in our Island population over the centuries. Photo shows County Archaeology staff excavating a skeleton at St Catherine's point a few years ago. These remains are part of the collection.